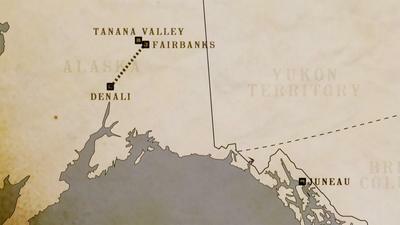 Clutching his 1899 Appleton's Guidebook to Alaska, Michael Portillo reaches the State's remote interior and the end of the Alaska Railroad. Less than 200 miles from the Arctic Circle, at Fairbanks, he discovers how gold prospectors liberated the precious metal from the soil. At Poker Flat, Michael reaches for the skies with the scientists who study the Northern Lights. Volunteers on the Tanana Valley Railroad offer him the chance to light the boiler of their 1899 Porter locomotive - a first for Britain's premier rail fan. In Alaska's railwayless state capital, Juneau, Michael researches the life of the remarkable author of his Appleton's, Eliza Scidmore, before heading to the railhead for his next Alaskan journey. He discovers her role in encouraging tourists to visit Alaska and finds out how salmon propelled the region to statehood.